The Declaration was adopted by the 17th World Conference on Tobacco or Health in Cape Town on 9 March, 2018 (Nr. 3). We, participants in the 17th World Conference on Tobacco or Health, meeting in Cape Town, South Africa, on 7-9 March 2018, and civil society organizations as well as individuals from across the globe, are firmly committed to promoting and protecting public health and human rights in relation to the tobacco epidemic, which kills 7 million people each year globally, and agree to the following general principles and call to action to achieve a tobacco-free world. 1. We agree that the manufacture, marketing and sale of tobacco are incompatible with the human right to health. In this regard, we reaffirm the value of the preamble of the WHO Framework Convention on Tobacco Control (FCTC), in which the Parties express their determination “to give priority to the right to protect public health,” and to respect the right of everyone to the enjoyment of the highest attainable standard of physical and mental health, as expressed in Article 12 of the International Covenant on Economic, Social and Cultural Rights (ICESCR). 2. We reaffirm the position taken by the Committee on Economic, Social and Cultural Rights in its General Comment No. 14 that the “failure to discourage production, marketing and consumption of tobacco” constitutes a violation of the obligation to protect under Article 12 (right to health) of the ICESCR. 3. The concept of the right to a tobacco-free world as a component of human rights implies the obligation of States to address human rights implications over the whole life-cycle of tobacco growing, manufacturing, marketing, distribution, consumption and post consumption, including child labor, violations of workers’ rights and the rights of special populations as well as environmental destruction. 4. We further agree that the manufacture, marketing and sale of tobacco are incompatible with other human rights obligations States have accepted by ratifying the FCTC and various global and regional human rights treaties, as well as under their own constitutions, in particular the rights to life; to health, including safe and healthy working conditions; children’s rights, including protection of children in tobacco production and from advertising; and women’s rights, including protection from the impact of smoking on pregnancy. 5. We welcome COP7 Decision 26 on “International cooperation for implementation of the WHO FCTC, including on human rights” and efforts by States Parties to enhance cooperation on the basis of that decision. 7. We welcome judgements by national, regional, and international courts that seek to protect the human rights of people from the effects of tobacco and the actions of tobacco corporations. 9. We welcome the inclusion within Goal 3 of the Sustainable Development Goals (“Ensure healthy lives and promote well-being for all at all ages”) of Target 3.a (“Strengthen the implementation of the World Health Organization Framework Convention on Tobacco Control in all countries, as appropriate”) and of age-standardized prevalence as the indicator of progress towards that target. However, the addition of “as appropriate” appears to be a concession to the tobacco industry that must not be interpreted at diminishing the rigorous application of the FCTC to achieve Goal 3. 10. We attach special importance in this regard to the adoption by the Human Rights Council of Resolution 35/23 on the Right to Health in the Implementation of the 2030 Agenda for Sustainable Development and to the report the UN High Commissioner on Human Rights is preparing in response to that resolution. 11. 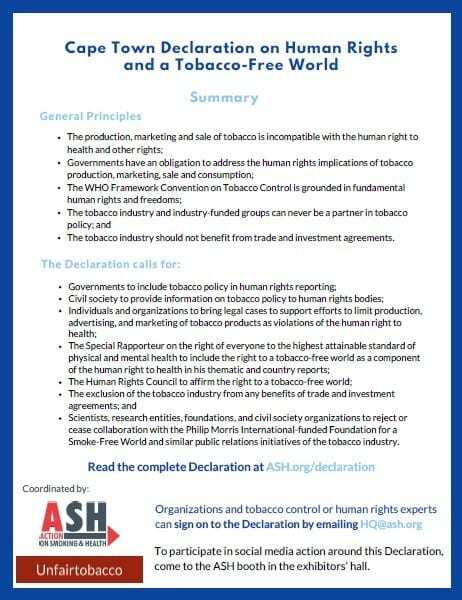 We consider that the United Nations Guiding Principles on Business and Human Rights and its respect, protect and remedy framework require the cessation of the manufacture and marketing of tobacco. The fundamentally harmful nature of the tobacco industry is such that it cannot be a partner in these efforts. The recent experience with the Philip Morris International-funded Foundation for a Smoke-Free World is further evidence of the need to consider initiatives by the tobacco industry as public relations ploys to advance their corporate interests contrary to the human rights of the public. 12. We welcome cooperation between the Open-ended Intergovernmental Working Group (OEIGWG) on transnational corporations (TNCs) and other business enterprises with respect to human rights and the FCTC Secretariat in clarifying the obligation to protect human rights against the influence of the tobacco industry and in focusing on how those corporations place profits before the public interest. 13. We support efforts – as part of safeguarding the human right to health – to exclude the tobacco industry from any benefits under international trade agreements, in light of the fact that any advantages of international investment, employment and marketing by international tobacco companies is far outweighed by the harm to the health and lives of the people who work in production of tobacco products and who consume them. 14. We call upon States Parties to all treaties affirming the right to health to include in their reports to treaty monitoring bodies explicit reference to measures taken and challenges faced in tobacco control that affect that right. 15. We call further on States Parties to the FCTC to include in their implementation reports explicit reference to their efforts to promote and protect human rights while implementing the Convention. 16. We urge public health institutions, civil society organizations, and human rights monitoring institutions to provide information on States Parties’ tobacco control measures under the reporting procedures of the human rights treaties, in particular the International Convenant on Economic, Social, and Cultural Rights (ICESCR), the Convention on the Rights of the Child (CRC), the Convention on the Elimination of All Forms of Discrimination Against Women (CEDAW) and the Covention on the Rights of Persons with Disabilities (CRPD). 17. We encourage legal support organizations to work with individuals and organizations affected by the tobacco industry to bring cases to support efforts to limit manufacture, advertising, and marketing of tobacco products as violations of the right to health. In this regard, we express the hope that the Supreme Court of India will soon adjudicate that the tobacco industry is “res extra commercium,” thus limiting the legal rights of the tobacco industry to challenge measures that discourage marketing and consumption of tobacco products. 18. We invite the Special Rapporteur on the right of everyone to the highest attainable standard of physical and mental health to include the right to a tobacco-free world as a component of the right to health in his thematic and country reports. 19. We invite civil society to provide appropriate inputs to the report the UN High Commissioner for Human Rights will prepare for the Human Rights Council at its 38th session in June 2018, pursuant to Council Resolution 35/23. 20. We call upon the Member States in the Human Rights Council to affirm the right to a tobacco-free world as a component of the right to health in a resolution or statement no later than 2021. 21. We encourage all States and other stakeholders to include tobacco control in the information they provide relating to the right to health when submitting reports under the Universal Periodic Review. 22. We urge national, regional and inter-governmental human rights institutions to support Sustainable Development Goal 3 and its target 3.a by actively promoting the implementation of the FCTC and other measures that seek to eliminate tobacco deaths. 23. We call upon the Inter-Agency Expert Group on SDG Indicators (IAEG-SDG) to prioritize Target 3.a, to disregard the qualification “as appropriate,” and to add other relevant indicators of progress towards this target. 24. We call upon the Open-ended Intergovernmental Working Group (OEIGWG) on transnational corporations (TNCs) and other business enterprises with respect to human rights to continue to work with the FCTC Secretariat on concrete measures to eliminate the extraordinary protection the tobacco industry has enjoyed for over half a century, and to explicitly reference tobacco in the new treaty, to encourage mutual reinforcement between the new treaty and the FCTC. The tobacco industry is an example for corporate subversion of public health and human rights measures and Article 5.3 of the FCTC that protects tobacco control policymaking from tobacco industry influence can serve as a model for the treaty negotiated by the OEIGWG. 25. We call upon governments participating in the G7 and G20 negotiations and in multilateral trade negotiations to explicitly exclude the tobacco industry from the benefits of any trade treaty. 26. We urge governments, scientists, research entities, foundations, and civil society organizations to reject or cease collaboration with the Philip Morris International-funded Foundation for a Smoke-Free World and similar public relations initiatives of the tobacco industry. 27. We suggest that the steps taken to implement the components of this call to action enumerated above be reviewed at the 18th WCTOH. 14. American Cancer Society, Inc.
41. Deutsche Gesellschaft für Pneumologie und Beamtmungsmedizin e.V. We agree that the production, marketing and sale of tobacco is incompatible with the human right to health.